I crashed in these Kevlar leggings - they saved my knee! Hi GoGo Gear! I just wanted to share this photo... I was in a bad motorcycle accident on Sunday where I went down in some twisties at 45mph. The first thing to hit the ground was my left knee, then I tumbled about 15-20 feet. I ended up breaking my clavicle clean in two, but I just wanted to say THANK YOU because these leggings SAVED my knee! I got a little skid inside and some bruising/swelling, but I know for sure that my knee would have been busted open and broken if I didn't have them on. I was so sad when the volunteer EMT told me they were going to cut them off of me in the ambulance while I was strapped to the board, but guess what? Because of the Kevlar they only made it about 2 inches before giving up so I'm going to just repair them instead. :) My knee and my skin are very grateful! 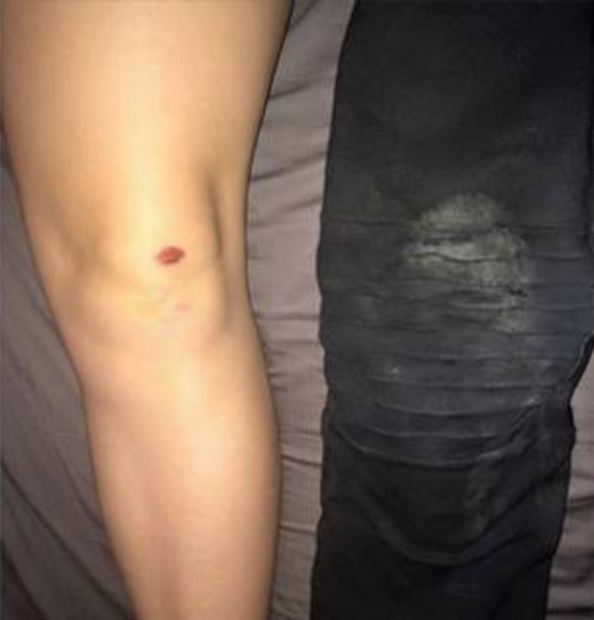 NOTE: The red mark on her knee is from her knee rubbing against the knee protector inside the leggings. There was NO road rash in this crash!